Democrats in Switzerland came out in force, voting from home and live at Geneva and Zurich events. Out of 768 valid votes cast, Switzerland voted 447 for Bernie Sanders, 319 for Hillary Clinton, 2 were uncommitted. A big win for Bernie. But worldwide it was even more striking: 69% for Bernie, 31% for Hillary, out of 34,570 votes cast! That means DA will send nine delegates for Sanders and four for Clinton to the Democratic National Convention in July. Voter turnout was 50% more than in the 2008, the breakout year for DA’s Global Primary. As a member, you can be a Democrats Abroad delegate in Philadelphia! Our delegation will be 21 plus one alternate, and aims to represent the diversity of our membership in terms of gender, age, race, LGBT and disability. Consider it! Deadline to apply is April 13, and elections will happen May 13-14 at the DA Global Convention in Berlin. But look into it NOW and apply ASAP. Zurich chair Renée Rousseau deeply thanks all the volunteers who pitched in to make the March 5 GPP Voting Center, the first ever in Zurich, a success. The polling place was a big factor in Switzerland’s record voter turnout for a Global Primary. NEXT UP: We need 3 volunteers for a voter registration table at the embassy’s America Day at the American Women’s Club of Zurich, Wed 6 April at 5:30pm (see below). Arrive before 4:30 to also hear the Ambassador’s address. Honoring President Obama’s historic visit to Cuba last week, a film about Cuba today. The ballet and its grande dame Alicia Alonso, 95, are still revered in Cuba. Film follows two young Cuban dancers and their mentor. See more at horizontes-film.ch. 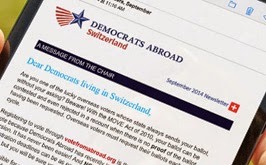 Special showing in English and German, a Democrats Abroad Switzerland/Zurich cultural event. Followed by discussion with the director, Geneva filmmaker Eileen Hofer, and appearance by Heidi Happy (title song). Free mojitos from Havana Cultura. Take a look at the event announcement. Democrats Abroad has reserved a block of 20 tickets. A sellout is likely, so buy your tickets in advance and please identify yourself as Democrats Abroad. Buy at kinohoudini.ch, click on HORIZONTES – 19:30. For those who cannot attend the Zurich premier, the film opens on Thursday 31 March in: Bern at Kino Rex (at 20:00 in presence of film producer); Basel at Kult.Kino; and Olten at Kino Lichtspiele. Address and Q&A by U.S. Ambassador Suzan G LeVine, consular outreach services, and voter registration by Democrats Abroad. Immigration: An urgent issue for Europeans as well as Americans and their Presidential candidates. This new film raises awareness of war journalists and their work, of what refugees face, why people become refugees, and of what NGOs in the field try to do to save their lives. See more at aardvarkfilm.com. Democrats Abroad co-presents the Geneva premier 20 April, 19:45 at Cinemas Scala. In multiple languages with sub-titles in French. With special guests: Film-maker Pierre Maillard and lead actor Carlo Brandt. Moderator: Jean Perret, Director of Department of Cinéma/cinéma du réel at HEAD. This showing is likely to sell out. Reserve tickets at events@democrats.ch. DA Switzerland is negotiating a block of tickets with Cinemas Scala, so watch your in-box for purchase instructions soon. “Across the Sea” will open on most other Swiss cities too in April/May, and DA hopes to co-present in at least one other city. Stay tuned! All DA members are invited to attend these election-year global events! Based on our Global Primary results, on Friday the EMEA Region of DA will caucus and elect its 3 Sanders and 2 Clinton delegates. The Asia/Pacific and Americas regions will elect their delegates simultaneously. On Saturday at the Global Convention, DA will elect three at-large delegates, plus six new representatives to the Democratic National Committee for the 2016 - 2020 term. On Sunday, the convention continues as DA establishes it platform and votes on resolutions. DA leaders will be there, and welcome any members who wish to take part (without voting).